Someone asked me this week what the one toy was that I never had as a kid but desperately wanted. 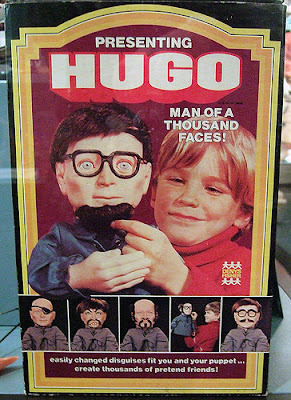 For me it begins and ends with HUGO THE MAN OF A THOUSAND FACES which was the least creepy ventriloquist doll I had ever seen. He always kinda reminded me of Yul Bryner. 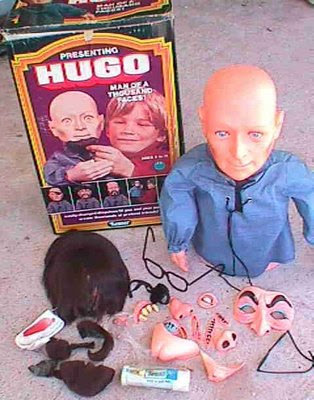 An added bonus was that he came with all kinds of disguise accessories that allowed you to create many other creepier faces. 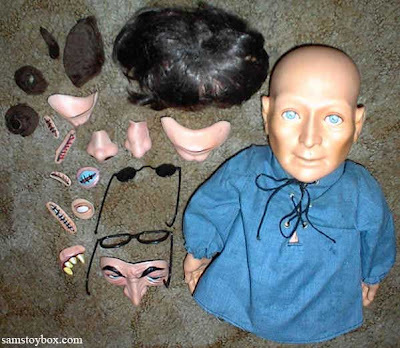 The thing I loved the most about Halloween was that I could get all those fake noses and teeth and scars and stitches for next to nothing in the week after Halloween when the corner store was trying to get rid of that stuff. I was all about the disguises back in the day It's why I loved acting so much - all the make believe. I never realized, of course, that I needed to blend in if I wanted to be a man of a thousand faces, not stand out. One of my favorite comics and short run TV shows was the HUMAN TARGET where actor Christopher Chance would impersonate people who were targeted for death and put himself into the line of fire. Nothing solves a murder for hire than trying to kill the wrong guy. In the Rick Springfield version Christopher Chance lived on this plane where high tech gear gave him flawless face mask copies of his clients and by studying them he was indistinguishable from them. Mission Impossible the TV series and the movies made from that show did those transformations well. So for someone who aspired to be the great impostor Hugo was all that and more for me. I never came across one in the store and I have heard bad things about how the pieces have stood up over time. It's hard to find one complete in box.